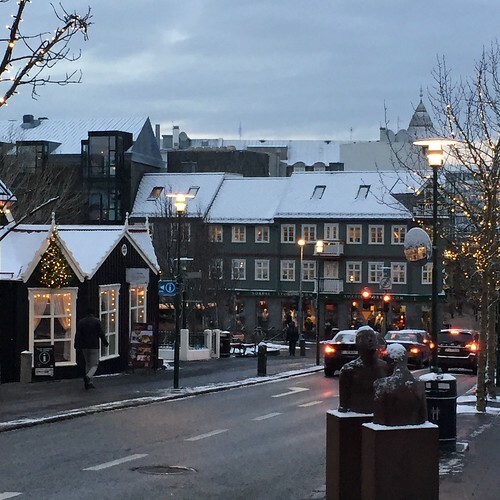 I’m just back from a winter trip to lovely Reykjavík, Iceland. It was full of Christmas coziness, warm thermal pools, sparkling lights and, of course, wool. Iceland had the biggest December snowfall in thirty years right before we arrived and a storm with hurricane force winds hit while were there. Thank goodness for those Icelandic Lopapeysa to keep us warm. We spent a lot of time in the Handknitting Association of Iceland, a co-op run by about 400 hand knitters. You could lose yourself in their stacks and stacks of sweaters, hats and mittens. Since I already have a pretty traditional Lopi sweater in natural colors, this time I bought one that was a little different from the Kidka Wool Factory in northern Iceland. I love a good hoodie and was attracted to the bright colors. This warmer will be perfect on cold Minnesota winter days for sure. 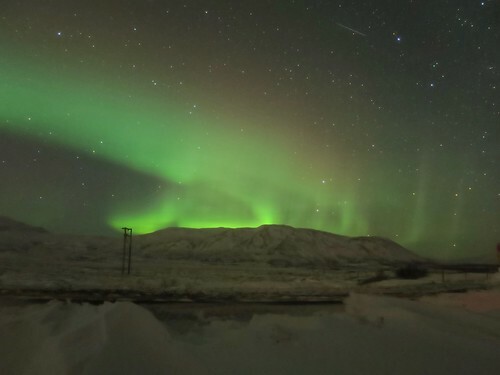 We were very lucky and treated to an amazing Northern Lights show on our first night in Iceland. The lights sparkled and danced through the sky. Sometimes we felt like we were under a dome of them. I was inspired to go back to the Handknitting Association and buy yarn in similar colors to make a pair of mittens. Jammed into a back corner of the store are shelves of many different versions and weights of Icelandic wool in every color. You can even buy it off of spools in any amount you want. They also have single patterns (in multiple languages), needles, and buttons. 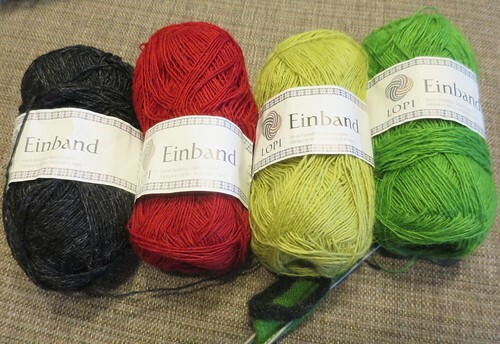 Einband, the yarn I bought, is a 2-ply lace weight. It is a little harsh to knit with but apparently washed up to a soft fabric. 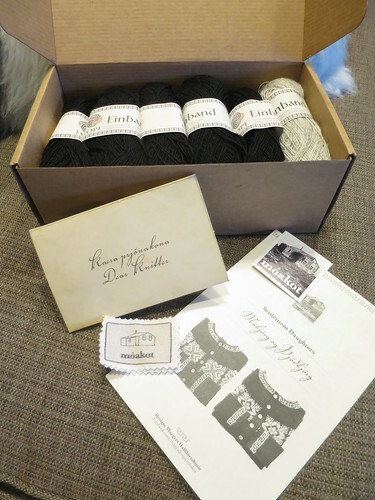 I also picked up this kit to knit myself a sweater. It was at the Handknitting Association, but I bought it from a store called Made in Iceland because they had a finished sample which sold me in the end. 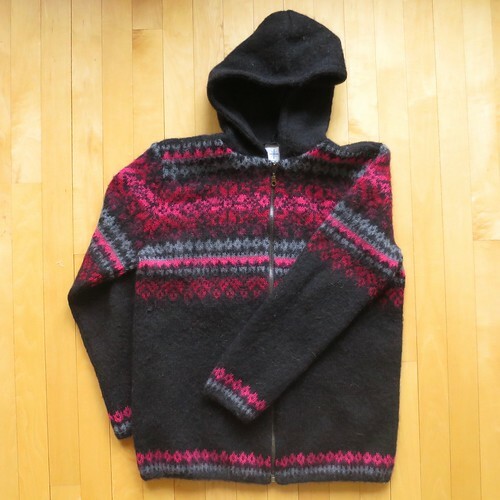 The kit, Móakot – Settlement Daughters, uses Einband so it makes a much lighter version of a Lopi sweater (or as she says in the notes, one that is not suitable for outdoors but still warm and durable). 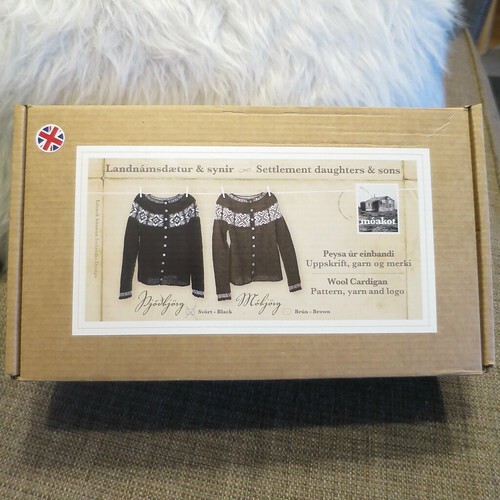 The packaging is beautiful and includes cloth labels, yarn, a letter with some history and tips for knitting with Einband, and the pattern with charts to make the Móbjörg or Þjóðbjörg design. I can’t wait to dive in! 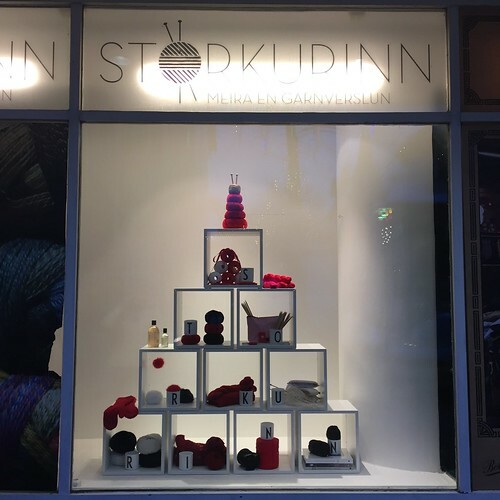 While the Handknitting Association feels like a crowded, dive-into-the-piles experience, Storkurinn is your more traditional high-end knitting store. It’s a beautiful place to sit and look through patterns and yarns. 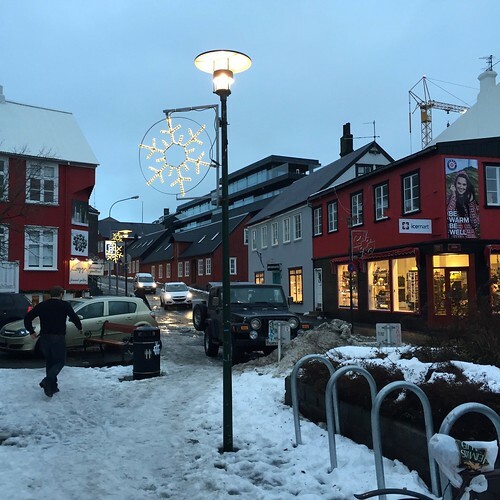 They carry the Icelandic yarns as well as yarns from around the world. 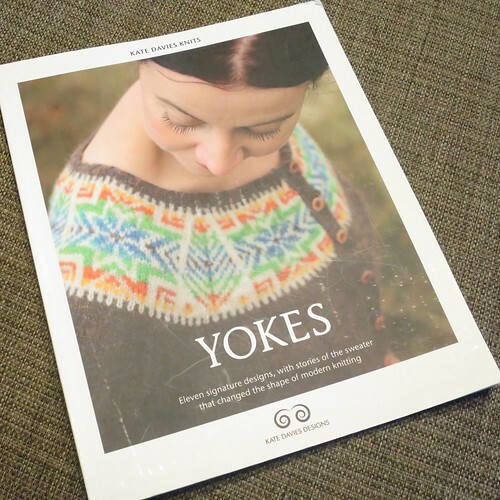 We ended up buying pattern books and magazines, like the Kate Davies Yokes that I picked up. If you would like to see more of my (non-knitting) picture of Iceland, they are all on Flickr. 3 years ago by Kat in Knitting , Needlecraft , Places We Go | You can follow any responses to this entry through the RSS feed. You can leave a response, or trackback from your own site. Oh, I am jealous! My two nights in Iceland last year were Not Enough. Is Storkurinn the yarn shop hidden in the basement of a bookshop? 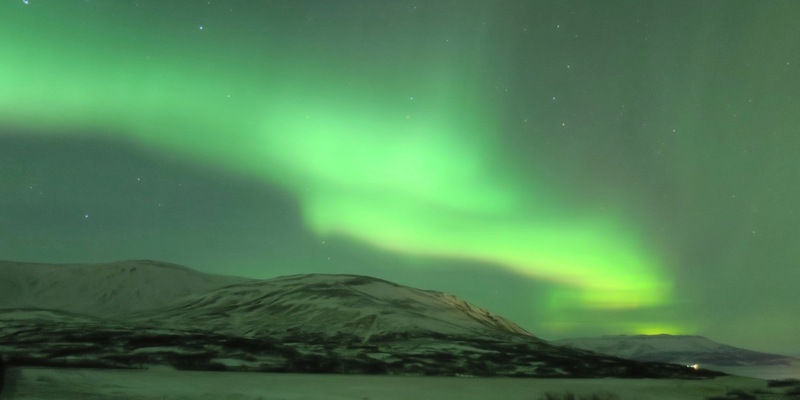 I really want to see the Northern Lights there too, and go to the Blue Lagoon. Storkurinn is on a second floor above a Bonus store. The Handknitters Association is down under street level. I didn’t go to the Blue Lagoon this time, it is very nice but busy. This time I went to Fontana Spa which was just limited to our tour group. Hmmm. I went to the Handknitters Association, but there was definitely another one that I found by accident in the book store. I went to the Fontana Spa too and really liked it! Did you have the bread cooked underground? I’m sure there are a lot of knitting stores around. They even sell yarn in some of the grocery stores! We did have bread cooked underground as part of our whole buffet there, it was very nice.